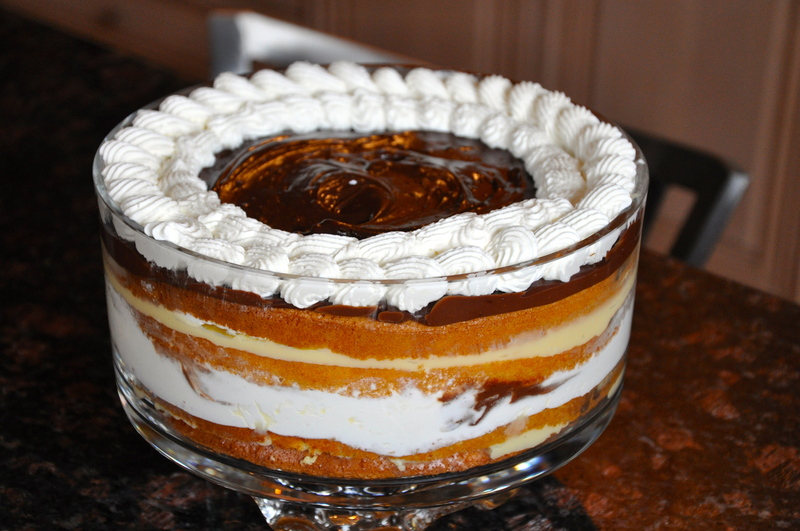 So Boston Cream Pie is what one typically refers to as a casual dessert. Delicious gloopy-gloppy vanilla pastry cream, melty chocolate ganache, all stuffed and layered within/ontop of a light airy sponge cake. Well, I don’t know if you guessed it or not, but I DO NOT DO casual desserts. Okay, I’m sure I will contradict that statement in the very near future, but for today, I was completely uncomfortable with the idea of “casual dessert”. This cake was commissioned by request, for a very special birthday man so of course I said yes, although I actually have never had a Boston Cream Pie before. Turns out, the recipe is a bit complicated, but worth it! Topped off with a bit of homemade whipped cream! 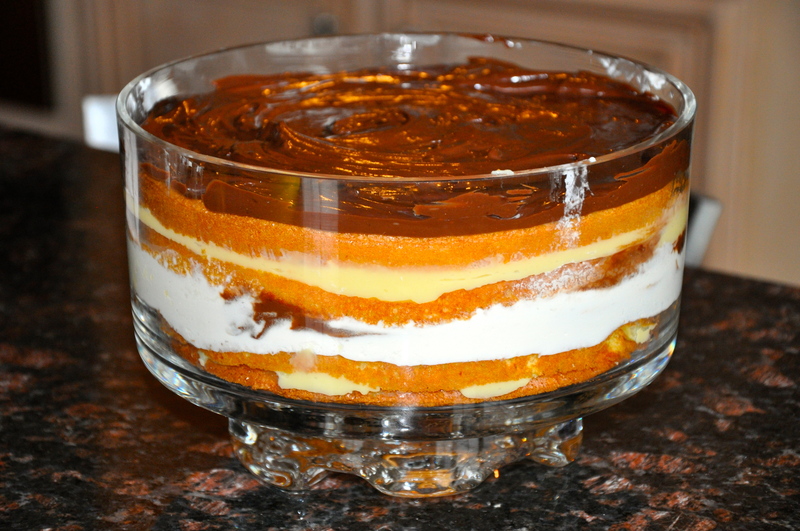 Instead of layer gloopy-glop, I envisioned Boston Cream Trifle. You can totally see how glass bowl and clean lines could appeal to me, can’t you? Anyways, a layer of cake, layer of custard, then a layer of beef, sautéed with peas and onions… (Feel free to guess the quote!) But seriously, I cut each cake in half for 4 layers to play with, alternating between custard, chocolate ganache, and fresh whipped cream “which, I made from scratch”. I can’t really tell which I enjoyed more however; the fantastic dinner: lemon-asparagus risotto with marinated shrimp, a mi madre, the Boston Cream Trifle a moi, or the game of Cards Against Humanity which we played after dessert. For those of you who know it, you know where this is going. For those of you know don’t; it’s basically Apples to Apples, with all moral, ethical, and appropriate boundaries removed. For a better understanding, the tagline is “A party game for horrible people” plus its got a age restriction so you know its good. Anyways, cue in full bellies, empty wine glasses, and questionable mental filters… hilarity ensued. It was definitely a bonding moment for us; siblings, boyfriends, a fiancee, and both parents… definitely recommended for a lot of laughs and a decent amount of shock/embarrassment. Feel free to boast your own family bonding moments below, I’m contemplating exploring this tradition further! Anyways, recipe is below! Like I said slightly complicated, but totally worth it. A light dessert actually, which was a nice change from my normal heavy dark chocolate delights. Somehow I managed to bake/make all parts of this and assemble in under 3 hours. I’m giving you directions for what I did below, you’ll probably find it in different orders depending on which recipe you find! This was thrown together among a few recipes. No shots of it being cut up – super messy! Recipe below! Happy Baking… it’s almost spring! Which means, a lot of exciting things are happening in my kitchen! Stay tuned for a few fun updates, soon to come! Serves about 8-10. First thing I did was make the Sponge Cake. Step 1. Separate the cold eggs – placing 3 egg yolks in one bowl and the whites in another bowl. Add the remaining 2 whole eggs to the yolk bowl (that’s the yellow bowl)! With your stand mixer (or handheld), beat the yolk/whole egg combination with 1/2 cup sugar on high until thick and fluffy (be patient at least 4-5 minutes). Look for ‘slow ribbon’ effect when lifting beaters to check. Beat in vanilla extract. Step 2: While that’s going, in another bowl, whisk together the flour, baking powder, and salt. Step 3: In a clean bowl, beat your 3 egg whites until foamy on low/medium speed. Mix on high as you gradually add sugar until you get soft peaks. Now, gently fold the egg whites into the yolk mixture, stirring to combine. In two parts, gently mix the flour mixture into the egg mixture until combined. Step 4: Place milk and butter in microwave safe bowl and pop it into the microwave. Heat until warm and butter is melted. 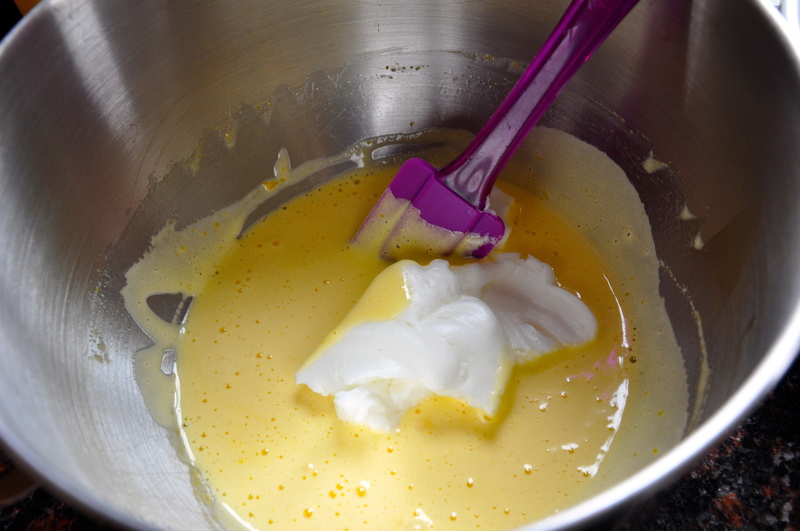 Gently fold butter mixture into batter, thoroughly mixing. Divide the batter evenly between the two pans, gently dropping each on the counter to remove large air bubbles, then stick it in the oven for 18-20 minutes or until springy to the touch and light brown. Take cakes out of pans almost immediately, running offset/spatula around the edges before inverting. Remove parchment paper and cool completely. If desired, use large bread knife to cut the cakes in half. Step 1: In medium heat-proof bowl, mix sugar and egg yolks. Separately, mix flour and cornstarch together then add to the egg mixture; mixing until you get smooth paste. Step 2: In a small saucepan, bring milk to just a boil over medium heat. Pour hot milk slowly into egg mixture, whisking continuously (to prevent curdling). Place mixture back into saucepan, and cook over medium heat until boiling, whisking constantly. As it boils, mixture will become quick, mix for about another minute, then remove from heat and stir in vanilla extract. 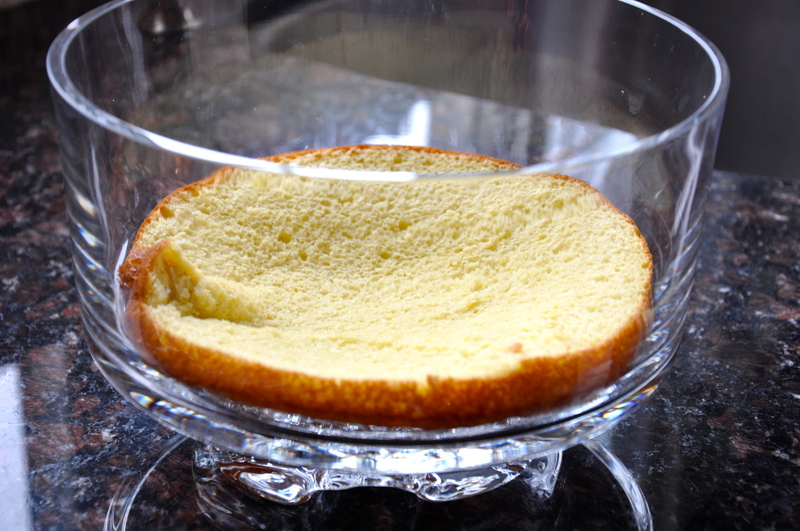 Pour into clean bowl and cover top with plastic wrap so you don’t get gross pudding-like crust on top. 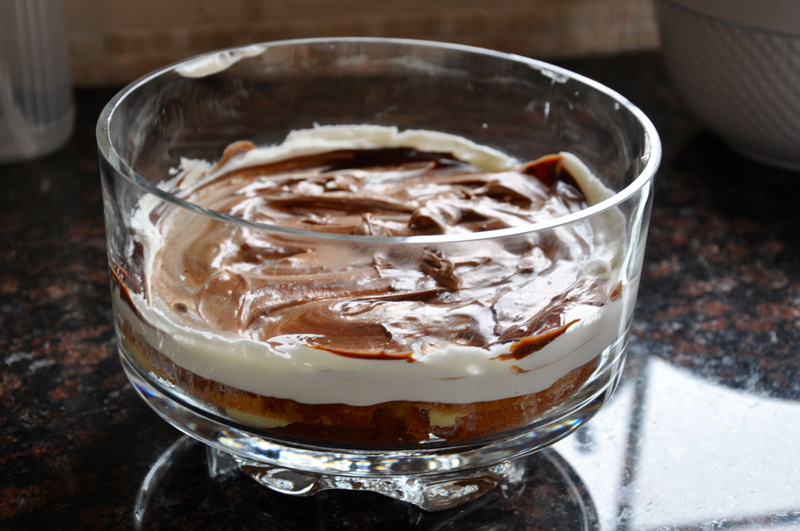 Let cream cool in fridge, or place bowl in ice bath for about a half hour. Place chocolate chips in small heatproof bowl. Bring heavy cream and butter just to a boil over medium heat. Pour boiling cream over chocolate and stir gently until chocolate has melted. Let cool on counter until desired consistency (about 1/2 hour). 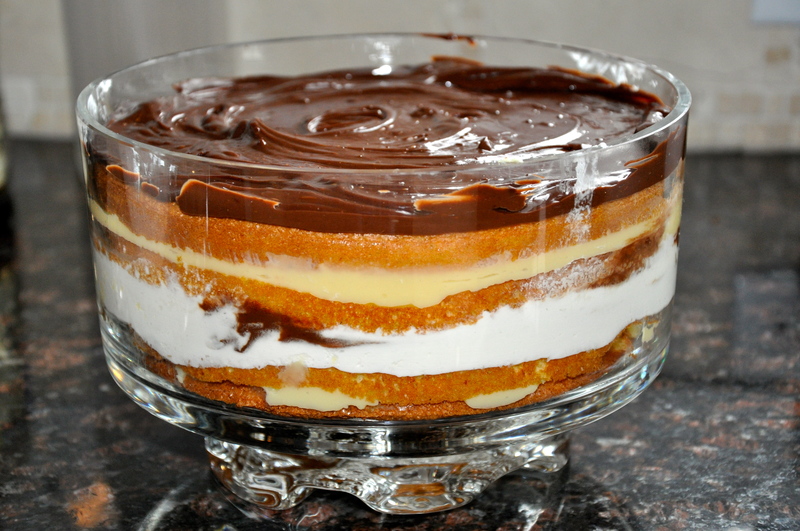 Assemble as desired, traditional Boston Cream indicated pastry cream between 2 cake rounds, and pour melted chocolate over top to run down sides. 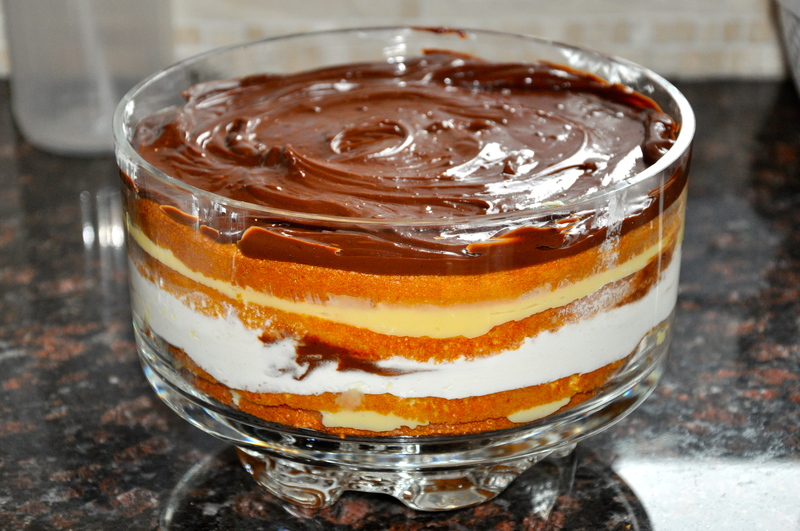 Alternatively, see portable and beautiful trifle above. ← Big Baking Bridal Shower!